Toulouse is a city in the southwest of France, located in the Midi-Pyrénées along the Garonne river. It is the fifth largest city in France, after Paris, Lille, Marseille and Nice and has roughly 1.1 million inhabitants. Canal du Midi - a 240 kilometre long canal in the south of France, le Midi. The canal connects the Garonne River to the Étang de Thau on the Mediterranean. The Canal du Midi is a UNESCO World Heritage Site. Toulouse-Blagnac Airport (TLS) is located about 6 kilometres from the city. About 30 airlines serve Toulouse directly, with destinations including Algiers, Düsseldorf, Dublin, Reunion, Lyon, Paris, Nice, Corsica, Lille, Marseille, Milan, Rome, Malta, Montreal, Geneva, London, Brussels, Madrid, Hamburg, Barcelona, Edinburgh, Belfast, Frankfurt, Amsterdam, Casablanca, Marrakech, Munich and Tunis, among a few other places. Shuttle buses to Toulouse city centre take approximately 20 minutes to complete the trip and they stop en route at Compans Caffarelli and Jeanne d'Arc (both on Metro Line B), Jean Jaurès (Metro Line A and B) and at Toulouse-Matabiau railway station. Taxis cost approximately €22 to Toulouse city centre one-way. 2 daily coach services connect Toulouse-Blagnac Airport to Andorra as that country does not have a commercial airport. Trains run from Toulouse-Matabiau station in the city centre. Regular TGV services run to Bordeaux, Paris and Lyon with connections to other destinations at any of these cities as well. There are also regular intercity connections for Bordeaux and Marseille (with stops at Carcasonne, Montpellier and Arles, among others) and for Paris via Limoges and Orléans. In addition, Spanish railways RENFE runs a daily AVE service to Barcelona in cooperation with SNCF. Toulouse is one end of the very scenic train line through the Pyrenees (TER Midi-Pyrénées line 22). This line passes through Ariège, and most trains end at in Foix. However, 6 trains a day continue from Toulouse and Foix on to Andorre-L'Hospitalet (the closest train station to Andorra) and Latour-de-Carol, at which you can change trains towards Barcelona. The train to Andorre-L'Hospitalet takes 3 hours, 30 minutes, and the full journey to Barcelona takes about 7 hours (including the change at Latour-de-Carol) and costs €30. Bus services to Spain, Belgium, Italy, and Portugal can be made through Alsa bus departing from the main bus station in Toulouse. 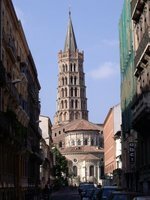 We have a comprehensive list of accommodation in Toulouse searchable right here on Travellerspoint. You can use our map to quickly compare budget, mid-range or top of the range accommodation in Toulouse and areas nearby. This is version 9. Last edited at 3:35 on Aug 2, 17 by sleepBot. 36 articles link to this page.